I spent Saturday afternoon at a very engaging session at CCME 2013 entitled “Taming the Paper Tiger: Transitioning to a Mobile Curriculum”. This was a very well attended and fast-paced session focused on how medical schools may (or may not) be moving their learning materials out of the traditionally distributed bundles of printed pages, and into digital formats that students access from mobile devices, amongst other means. Chaired by David Lampron from UBC, this was a symposium put on by 3 faculty members and one medical student, from 4 different institutions, each of which had a different perspective on this issue. The collected tweets from this presentation can be found under the hashtag #papertiger, or at Storify. One might think that students from the current generation of learners would be 100% in favour of abandoning paper materials and embracing the greater accessibility and flexibility of digital media. After all, interactive technology has been part of their general educational environment their whole lives. We also frequently hear news stories of “medical schools giving their students iPads” as the only way the students access learning materials. However, as Joanna Li, med student from McGill found out when surveying her classmates, there is a substantial resistance to the idea of abandoning paper formats, despite the respondents’ description of themselves as adept with web based and other technologies. Similar surveys at Queens and U of Manitoba have shown preference for paper in the range of 10-40% of students surveyed. What’s behind this? According to Joanna’s work, much of it has to do with individual student variation in studying practices. Many of her classmates take notes on laptops during lectures and seminars, then condense, print, highlight, annotate, or otherwise manipulate the notes, in paper form. There really is no substitute for printing, if that’s what students need to do, and it seems that this need was felt across these 3 schools. In Toronto, we have been trying to find ways to convert various stacks of paper notes to digital format, but have encountered the same resistance. So there is a certain resonance – there just seems to be something about a good old Bic pen and a dog-eared stack of lecture notes that works better for many students. Clear message: Force digital on students at your own risk! Deirdre Bonnycastle (@Bonnycastle) from U of Saskatchewan, known to many in the medical education community as a fluent user of many digital platforms, spoke next. She debunked the notion that age has anything to do with digital proficiency, by demonstrating how she has developed her own use of digital tools since the 1970s! She did note however, that the students of today don’t think of digital cameras or cell phones the way we older types do – they are not novel or unique, they’re just plain old “cameras and phones”. Meaning that many of these devices and services are just accepted as part of the landscape the students have always known. Having said that, she made the point that there are still variable levels of comfort and sophistication in using the digital platforms of today for accessing and manipulating learning materials. This isn’t really an age issue, but a comfort issue, drawing the distinction between “digital residents” and “digital visitors”. Deirdre spends a lot of time trying to make her learning materials comfortable for both. Ali Jalali (@ARJalali) countered the pessimistic trend of the previous speakers with the U of Ottawa experience. The faculty there was gradually evolving a digital platform for medical students but still printed notes for students who wanted them. After a little while, they found that <10 out of 160 students (if I remember correctly) were picking up the notes. They figured that they could abandon paper with minimal damage. How did they do this? I think, based upon Ali’s presentation, that they did it by reinventing the whole concept of lectures and learning materials for information transfer and application at the same time. Digital learning materials are not just “notes”. They are a whole repertoire of electronic resources, including podcasts (15 min max briefing on topics, students can listen to them even without internet access), links to related learning materials, 3D visualizations for anatomy, and other animation based materials that go far beyond what paper could ever do. 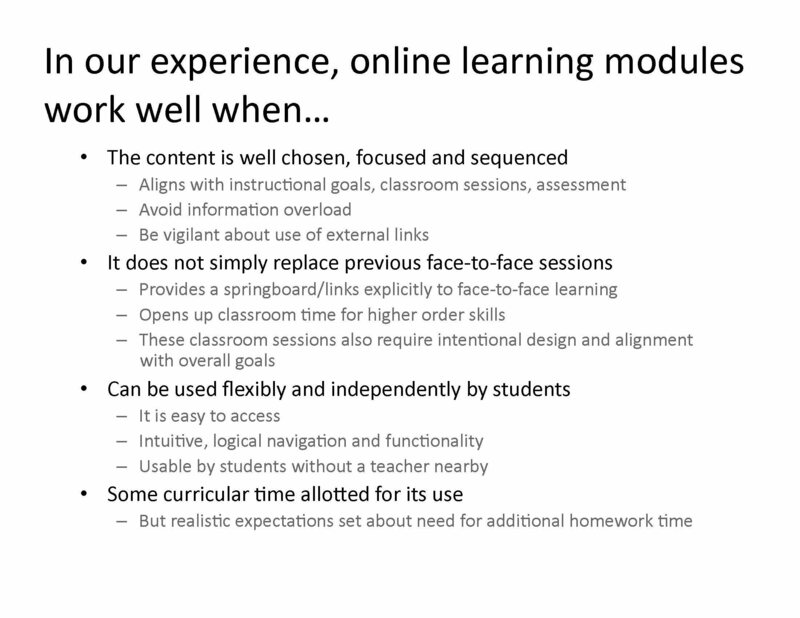 They combined this with a flipped classroom model, where the professor’s time (Ali, an anatomy prof, in this case) is used for consultation by students, rather than delivering material. Ali says, “If my lecture can be replaced with a podcast, then I shouldn’t be lecturing.” He was true to his word, eliminating all anatomy lectures, and replacing them with other experiences that allow students to work together to solve problems (e.g. in dissection), and consult the instructor when needed. Apparently U of O students are not crashing down administration’s doors about the lack of paper notes. Is this just a matter of “shove the change along, they’ll have to get used to it?” I don’t think so. Ali demonstrated that by replacing paper notes for typical lectures, with a program that was clearly able to do more than either of the old forms ever could, his faculty could get students past their dependence on paper, and use current learning technology as a better replacement. Ali also highlighted the many extra considerations that had to be brought in – for example, anything to be downloaded or streamed needed to be available in both high and low def, because not all students have broadband internet at home. All told, this was a huge effort, that seems to have paid off. This seems like a revolution. But revolutions are not always feasible, nor do they always succeed. Lindsay Davidson (@KT4education) from Queens finished the session with her 10 years of experience “going digital” gradually. She is an orthopedic surgeon who teaches a first year MSK unit, and in 2003 she put all her notes on a CD – with hyperlinks! She did all this at home, in her basement, burned all the CDs herself, and then learned that her students had printed everything off on their own once they got the CDs. Clearly this was an idea ahead of its time for this setting… Undeterred, Lindsay began to evolve her approach, incorporating more and more digital learning material such as online recorded patient experiences, web pages, and electronic archives of resources, to supplement the notes made for her by her lecturers. Things still were made difficult, though, when faculty didn’t give her the notes early enough to get to students, or changed them after students had printed them. Like every other evolutionary process, the environment played a key role. At Queens, they adopted a comprehensive learning management system which was capable of hosting and linking to all the students’ resources. At the same time, they began to embrace Team Based Learning (TBL) as a paradigm, unburdening the daily schedule of its lectures, and in doing so built in “directed independent learning” time. No lectures – no notes – greater range of resources needed – more digital access provided. The classroom was repurposed for discussion and consultation with peers and with profs. Is it working? Their modules have become significantly enriched with new materials over the last few years, and students now refer back to them, later on in clerkship, when they need to refresh their knowledge. I think this says it all – but here’s my summary anyway. 1. Don’t think that paper notes can just be taken away. They evolved for a reason – they’re flexible, don’t require recharging, and have helped students learn for decades. Pull them away and you will be facing a lot of protest. 2. If you plan to replace paper based learning materials – don’t just post a digital “equivalent” like a bunch of PDFs. These are NOT equivalent; they are inferior in many ways. Even the most sophisticated tablet and stylus setup can’t compete with the simple flexibility of paper and pen. Hence the students’ resistance – you’re making their life more difficult. 3. Notes are only part of your ecosystem. You will need to reconsider ALL your approaches for information transfer, acquisition, application, and extension. Replace notes with sources of information that they can’t compete with. 4. Give the students scheduled time to explore these richer resources – remember, they can take longer, especially if they encourage a lot of exploration – and compensate by reducing the one way information stream found in lectures (which were the only things that really needed notes anyway). 5. Honour face-to-face time for higher level activities – discussions, questioning, hypothesizing, testing, and feedback. Remember, if your teacher can be replaced by a digital resource, they should be. 6. Don’t be surprised when some students need support and guidance in using this brave new system – they’re not all digital experts, and part of our job as educators is to help them develop their ability to learn in our environment. Good new habits can be developed.